Clean fish well in salted water. Heat oil in a pan. Saute onion, garlic, ginger, chillies, peppercorns and curry leaves. Add thin coconut milk and stir to a simmering point. Add fish pieces and salt. Cook the fish over low heat with the lid on until the gravy thickens. Stir in tomato and thick coconut milk. 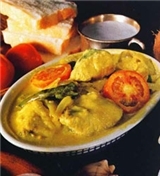 Continue to cook over low heat for a few minutes, taking care to see that the curry does not curdle.